With statistics showing that half of all Americans age 30 and older have some form of periodontal disease, there is a good chance that you may require periodontal treatment at some point in your life. Dr. Brent Copeland provides soft tissue management to patients with gingivitis, the first stage of gum disease, and periodontitis, the more advanced stage of gum disease. Periodontal disease – also called gum disease – is an inflammatory disease that affects your gums and jawbone. Its earliest stage is gingivitis, a condition in which the gums are swollen and red due to inflammation. 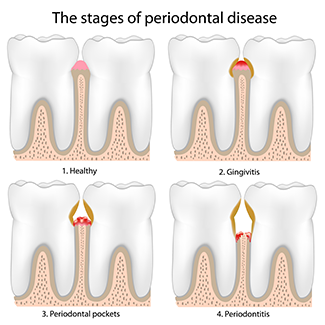 Periodontitis is the more serious form of gum disease. It destroys supporting gum tissues and causes the gums to pull away from the teeth. Bone can be lost, and the teeth may loosen or even fall out. While gum disease cannot be cured, it can be managed with special treatment and more frequent periodontal cleanings. Our conventional periodontal treatment includes scaling and root planing. This deep cleaning process removes inflammation-causing plaque and calculus from beneath the gumline and along your teeth roots. Dr. Copeland may prescribe Arestin, an antibiotic treatment placed beneath the gums in the pocket. The antibiotic continues to kill bacteria for about 21 days following your deep cleaning appointment. The purpose in prescribing this is to keep the bacteria count down to allow your gums heal and reattach properly. We inspect your mouth for signs of periodontal disease at each appointment by measuring pocket depths and assessing other factors. A huge step toward staying on top of periodontal disease by catching it in its early stages is in maintaining routine dental checkups and professional cleanings. Call today for an appointment if you exhibit signs of periodontal disease, or if it’s been more than six months since your last dental examination.